This is not a review, more of a "did you know this exists"
Very interesting, they have a great web page explaining their product. I would be open to try one of these on a long hike. Also on the same website I found some other canned Made in Finland products that might be desirable for winter canoe trips. Many American hunters, shooters and campers hold Finish products in high regard. I was very intrigued by these. There is a definite dearth of hand bar meals of a savoury variety, which is odd as they seem very popular - i.e. pasties and pies, burritos, etc etc. So I went to the linked site and bought a box of the chilli beef ones. They arrived here in the UK within a few days. Good packaging too. My first impression was that they seemed a bit small, roughly 10cm X 5cm (4inch X 2.25inches) - a little bigger than a weetabix - they are very dense and hard - texture like moist pumpernickel or like a cold burger. The taste? Not bad - very savoury and a bit indistinct - notes of beef jerky as the predominant flavour, but sort of dilute and background. Not really any flavour of Chilli - be ok to have these once in a while, but you'd go mad if that was all there was. I ate it cold as this seems to be the intention - there is no heating instruction at all on the packaging - does anyone know if you can? 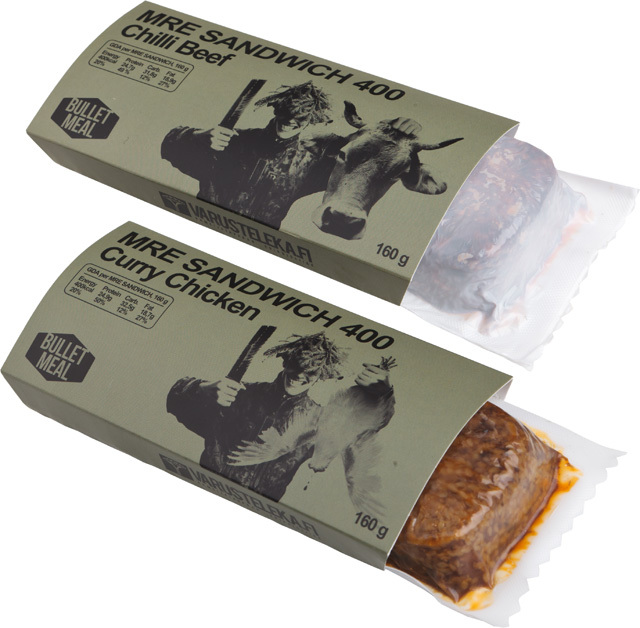 I would buy more in other flavours to keep in a BOB, but the wet MRE or Rat Pack food is nicer and more tasty. But as intended, you could stuff a load into a pack and never have to get out the utensil and bowl for days - Job done! Thanks for the update on these SugarLord The closest thing I've eaten here in the states has been the Tanka Bar (short for Tatanka, a native name for the American buffalo). I haven't had one in a few years, but I recall enjoying them. 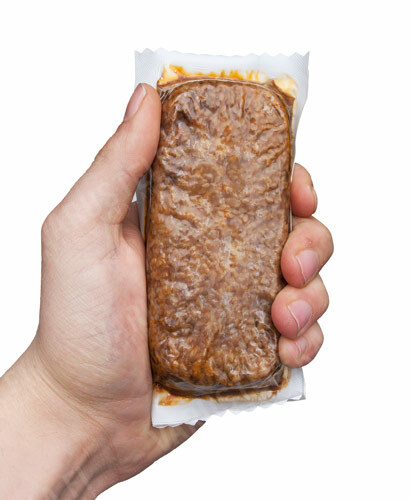 The energy bars and hiking foods I seem to find tend to be more carbohyrdate based - finding something meat based that isn't just jerky is rare. Back when I was backpacking (1965), there was a "Bacon Bar", basically cooked crumbled bacon formed into a bar. I'd be tempted to order a few but the 29 euro shipping cost is a deal breaker for me.